From Grand Teton National Park we drove North on the Rockefeller Memorial Highway. 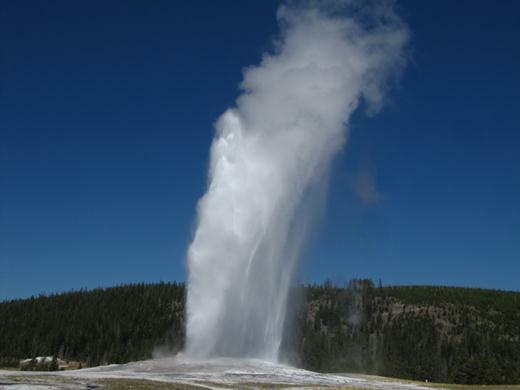 Of course we already knew about Old Faithful and that Yellowstone was a highly volcanic area. 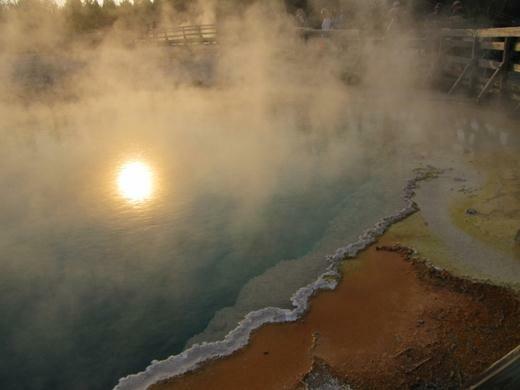 But we didn’t know that Yellowstone National Park is an active supervolcano! 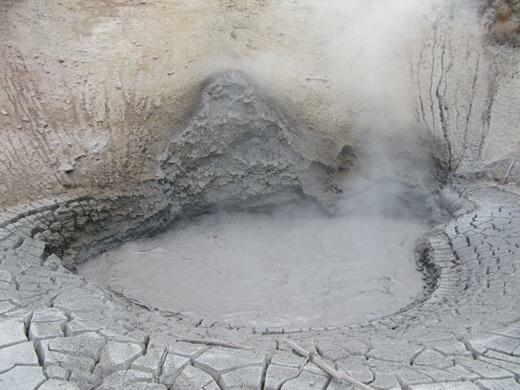 That’s right – this park is sitting on a huge hot spot with a magma reservoir just four to six miles below the surface. 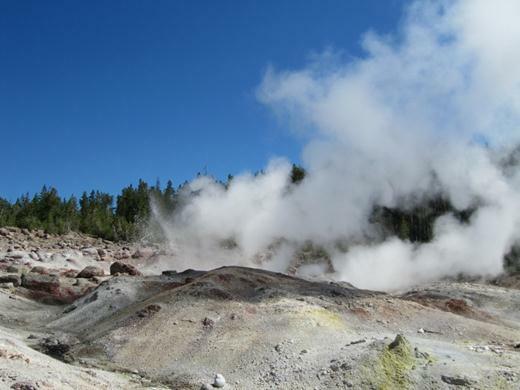 That’s why there’s so much thermal activity in the park. 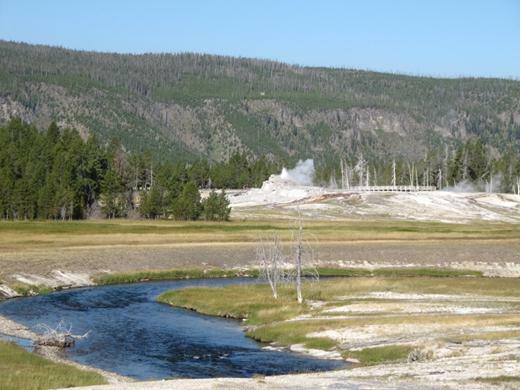 Old Faithful (pictured above) is just one of 10,000+ geo thermal features within the park boundaries! 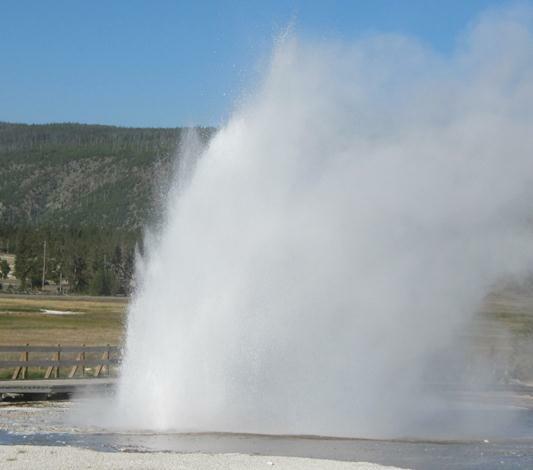 Old Faithful is the most famous – in part because it has predictable eruptions that occur frequently (about every 90 minutes, plus or minus 20 minutes). 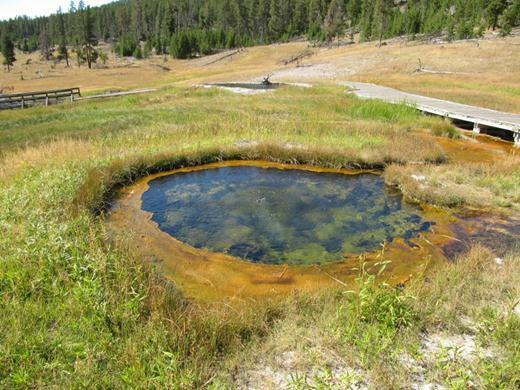 It’s also one of the most accessible Geysers because it sits right behind the visitor center. 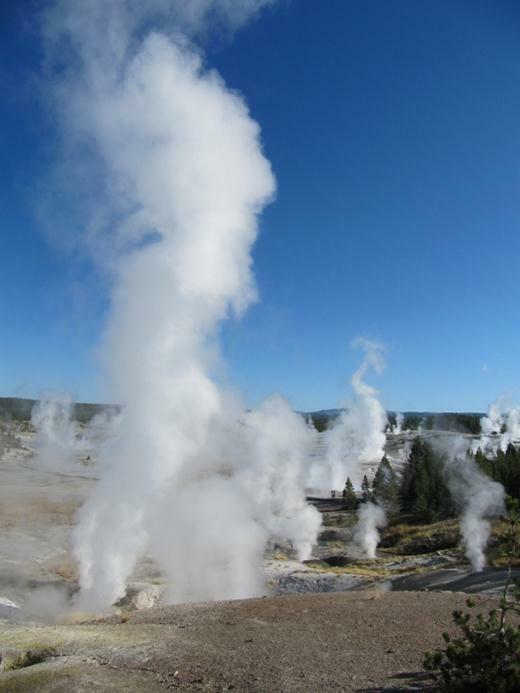 …like Steamboat Geyser – which is not predictable but has eruptions that shoot 90-120 meters into the air! 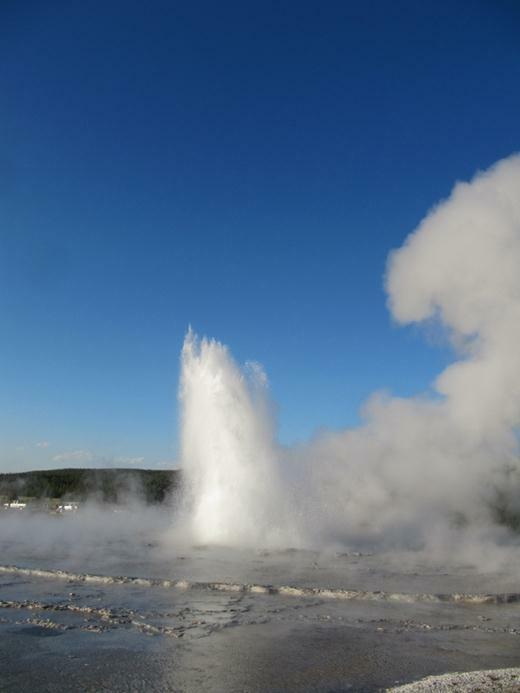 …while Plume Geyser erupts nearby. 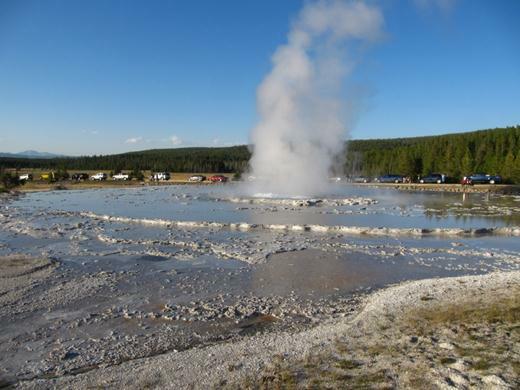 Great Fountain Geyser is another amazing one to see. 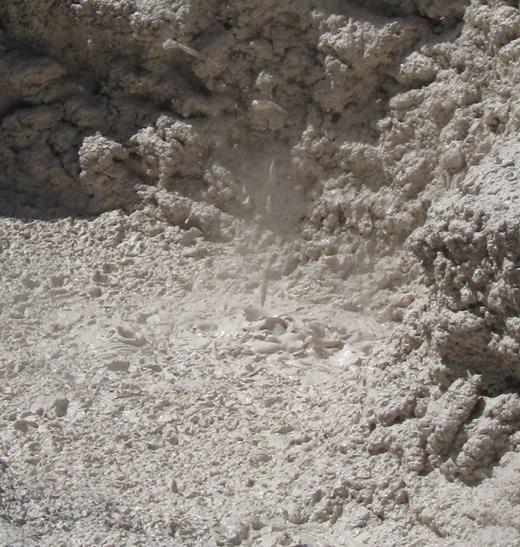 We were lucky enough to be driving by as it prepared to erupt. 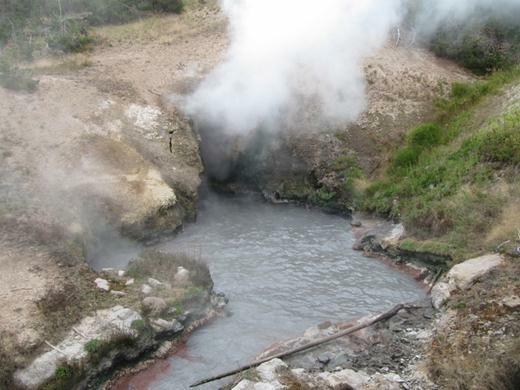 The eruption itself can last up to an hour, shooting water 30-85 meters (100-200 feet) into the air! 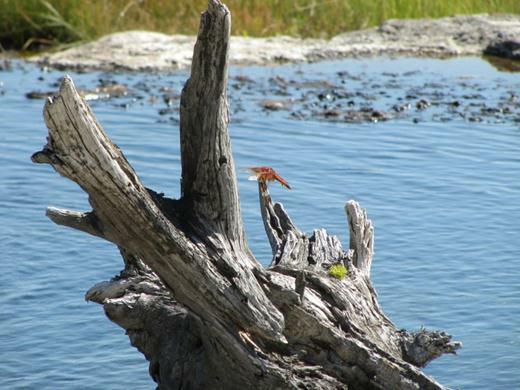 This one sits right by the edge of Yellowstone Lake. 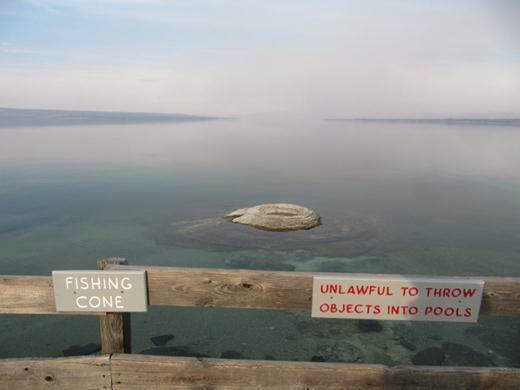 Fishing Cone (pictured above) in particular has an interesting story. 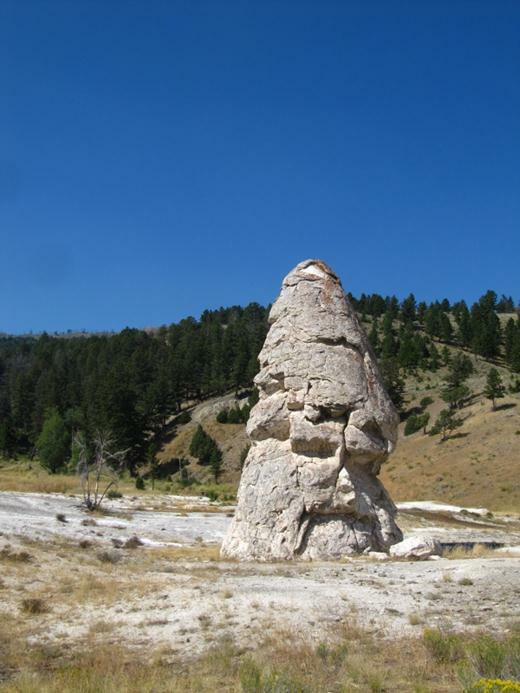 Visitors used to stand near the lip, hook a fish in the lake, then pivot and cook it in the boiling water of the fishing cone hot springs! …but they are all close to boiling temperatures and would seriously burn anyone who touches it. 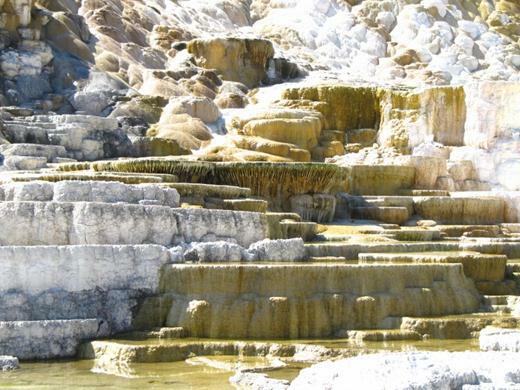 Animals, like Buffalo, do fall in and scald to death. 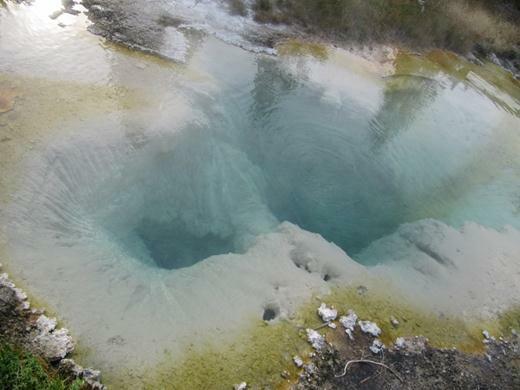 A few of the springs have bones in the bottom from just such an event. 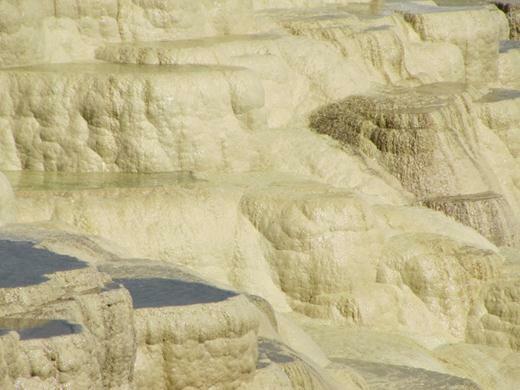 The terraces are made of travertine – slowly deposited over time. 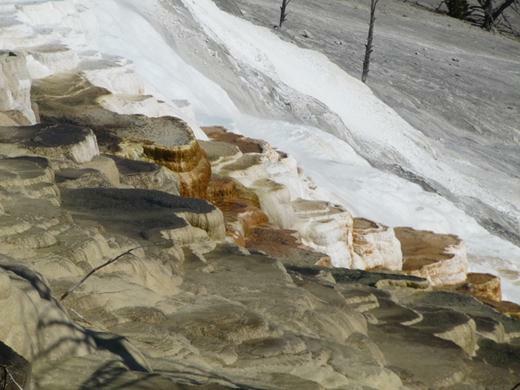 The white stuff looks like snow, but it’s actually travertine. 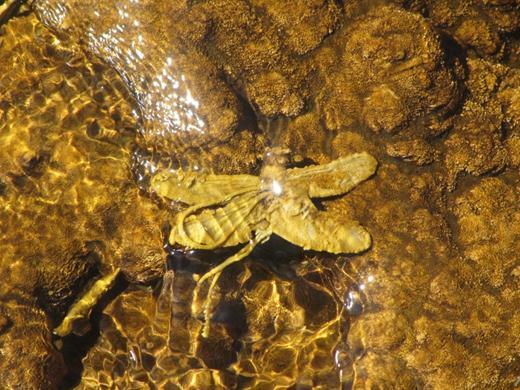 This little dragon fly will surely be a fossil for future generations. Don’t worry; there are tons of live dragon flies too. Check out this red one! We met Brian and Claudia at Mammoth. 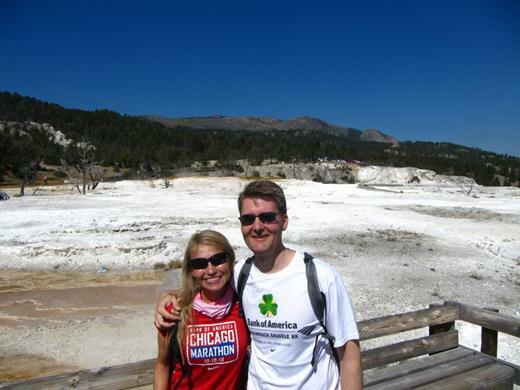 These two celebrate their anniversary by visiting a different National Park each year. 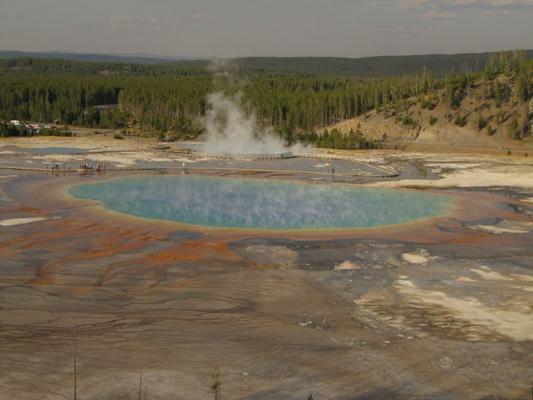 But the Grand Prismatic takes the cake…beautiful! 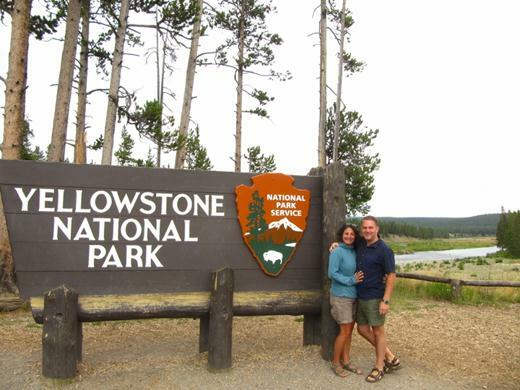 Next up…Yellowstone National Park – Part Two. So glad you wrote in! We were thinking of you two just the other day. Glad you enjoyed Dornan’s. It’s definitely one of our favorites.